There is no mention of a College Crest in any document prior to 1892. Ceylon being a Crown Colony of the British Empire, the Imperial Emblem-Lion and the Unicorn was Ceylon's Badge. 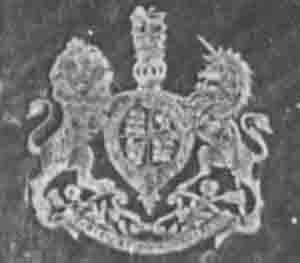 The Colombo academy named later Royal College being a Government Educational Institute had to use the British Royal Arms Emblem. The first display of the crest (Royal Arms) is on the cover of the first Royal College Magazine of January 1893. In 1985 the Cricket had a simple Crest on a Blue Blazer. The Crest on the top Blazer pocket had a shield with the letter R.C. in Gold with a scroll. The word FLOREAT was embroidered in Gold letters above the Shield. The photographs in this Chapter depict various designs of the Imperial Emblem on the Magazine cover and on the cover of books given at the College Prize Distributions. The book given as a Prize to R.A.I. Ekanayake (Cricket Captain) in 1897 has the Lion and the Unicorn Emblem. 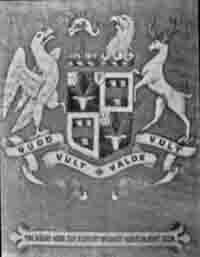 The British Royal Arms was used by the Cricketers as the Crest on a Blue Blazer from about 1905 and continued to be used till 1921. 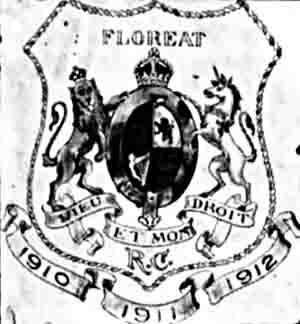 The word FLOREAT appeared above the Crest and letter R.C. below the Crest. The Royal Arms was rounded with Blue and Gold braiding resembling a Shield. The year in which the player represented the College appeared on a scroll below the Shield. The New Royal College Arms.